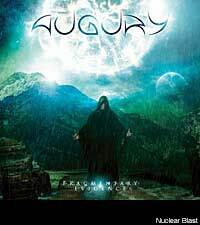 It's difficult to pin down the meaning behind the artwork adorning Augury's second album, 'Fragmentary Evidence.' A hooded figure stand atop a mountain in the middle of a downpour. His arms are spread out as if welcoming us to the picturesque scene. Oh, and there's a full-sized planet on the horizon, looming dangerously close to Earth's surface. Planet X and conspiracy theories aside, there are some further clues on the Montreal natives' MySpace profile. The photos of the individual members in the left column sport glowing orbs over their eyes. This may signify some time of enlightenment or special knowledge -- a somewhat common theme that seems to creep into the aesthetic of progressive-leaning bands -- or perhaps that Nuclear Blast's insurance agent needs to find them a decent opthamologist. The artwork was created by Sven de Caluwe of Avernus Studios, who is better known as the vocalist for Aborted. Avernus has done designs for the likes of Despised Icon, Textures and Genital Grinder.